The residual thermal stresses induced in high-porous fibrous silicon nitride ceramics with fine reinforcement inclusions have been computed within numerical experiment. The computations have been performed employing a coupled transient linear thermoelastic problem. The initial state characterized by zero internal stresses is observed when the material is synthesized at high temperatures. Three-dimensional representative fragments of fibrous structures generated with stochastic algorithms accounting for the set microstructural parameters have been used for the simulation. The effect of the volume content and size of reinforcement as silicon carbide spherical inclusions on residual thermal stresses has been demonstrated. The simulations show that the residual stresses are commonly higher than the ultimate strength of the porous materials under study. Translated from Poroshkova Metallurgiya, Vol. 57, Nos. 11–12 (524), pp. 53–61, 2018. The research effort was funded under the Federal Target Program ‘Research and Development in Priority Areas of Science and Technology of Russia for 2014–2020’, Agreement No. 14.574.21.0166 (Unique Identifier RFMEFI57417X0166). 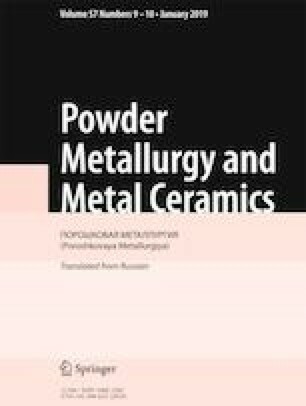 S. Somiya, Handbook of Advanced Ceramics: Materials, Applications, Processing, and Properties, Salt Lake City, USA (2013), URL: https://www.researchgate.net/ publication/291156581_Handbook_of Advanced Ceramics: Materials, Applications, Processing, and Properties.